Peas is an annual herbaceous plant. The stem is hollow, with the clinging tendrils of various lengths. Stained stem - from light green to dark bluish-green. Most varieties of vegetable pea have white flowers, are bisexual and self-pollinating. Pea fruit is a bean which is called a pod. A bean, depending on grade has a different shape, size and color. Each pod contains 4-10 seeds arranged in a row. The shape and color of seeds is varied, their surface is smooth or wrinkled. Color of the skin corresponds to the color of flowers seeds of this plant. There are two main groups of peas: shelling and sugar. Shelling varieties are differ from varieties of sugar by presence of parchment layer on the inside flaps of beans, that makes them inedible. This pea is grown for green peas which go for canning. Sugar varieties don't have partitions (parchment layer) and are grown for immature beans (blades). Immature, tender beans, whole without husking seeds are edible. There is also a type of vegetable semi-sugar pea where parchment layer is weak and only noticeable in the dried beans. Peas was widely cultivated in ancient India and ancient China where it is a symbol of fertility and wealth. In ancient Greece and ancient Rome, peas was the main food of poor people and in France in the XVI century peas with fried bacon and fed at the table of the king, and the table commoner. In Spain, as in Russia one of the favorite dishes was pea soup with ham. The Germans, too, appreciated and loved peas. They are widely cultivated it, prepared from it a variety of dishes,and in the XIX century in the daily diet of German soldiers appeared even pea sausage. But such people's love, as in Russia,"King peas" hasn't anywhere in the world. The low calorie, dietetic product containing 55 g per 100 kcal. Peas boiled contains 60 kcal. 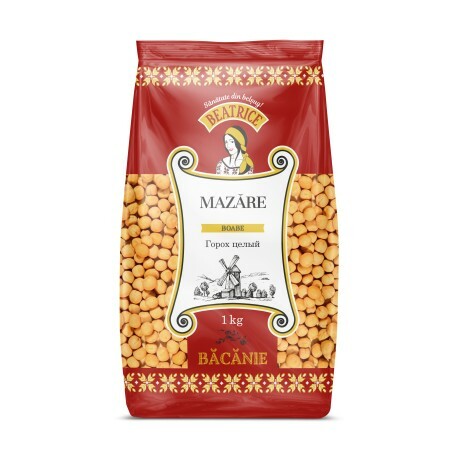 In dry peas increase carbohydrate content and calorie content is 298 kcal per 100 g. Therefore it is not recommended to use the peas in this form in large quantities for people suffering from obesity.